With temperatures in the low 90’s summer is here in Central Florida. Your roses will not be at their best for the next 4 months. However, they will continue to produce some nice blooms, if you keep in mind that they need plenty of water during the hot weather. They also need regular protection against black spot and spider mites. Continue your weekly spraying for black spot using Cleary’s 3336 and Dithane or Funginex and Dithane, or you may prefer to alternate these. Wash down the underside of the foliage under pressure at least twice a week to control spider mites. You may use a water wand or a regular hose nozzle for good results. 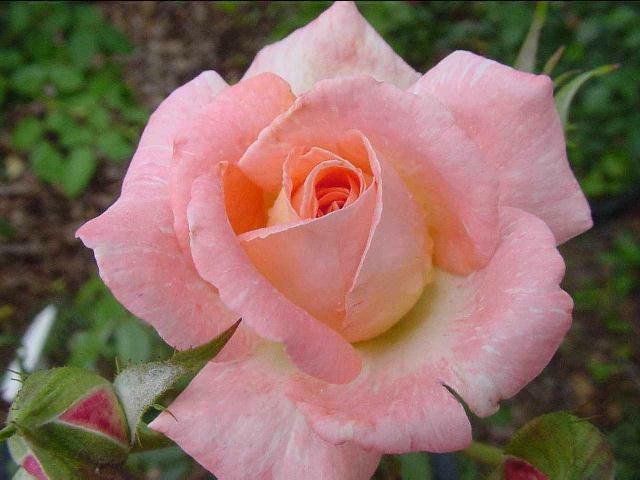 The roses will love a good bath anytime during the hot weather as long as the foliage dries before night falls. Wet leaves over night will encourage the spread of black spot. Some Rosarians continue their regular fertilizing program of feeding every two weeks during the summer months, while others prefer to cut back on the amount of chemical fertilizers used. I prefer the latter approach. I use chemical fertilizers about once every four weeks during the hot weather, using either the liquid or granular types. Organics can be used anytime. I will add some Milorganite at least once during the summer and probably some cow manure compost. Fishmeal and fish emulsion are great to use anytime. Be sure you have plenty of mulch in your garden to protect the roots and hold the moisture three to four inches is recommended. You will need to fight the weeds all summer long. When the rains finally start, the weed will really multiply. Save your back as much as possible by using Round-up or some other weed killer. But be careful to protect your bushes, or they will get damaged. Summer is a good time to propagate. Try rooting some cuttings this summer. Use a jar or plastic covering to keep the cutting moist and use a light potting soil and you should have good success. If you use a rooting compound on the planted tip of the cutting after roughing it up a bit, you will increase your success. I get a lot of satisfaction from starting new rose bushes, and I believe you will too.